What type of leather is best? One of the most confusing things when looking for new leather furniture can be all the terminology involved. Here is a breakdown of some of the most pertinent terms used to describe leather. Full aniline leather gets its name from the type of dyes that are used to produce the leather’s color. Leather hides are soaked and tumbled in large stainless steel drums containing the translucent dye. This dye is absorbed by the pores of the leather and permeates without covering natural markings, or grain variations. Leather hides dyed this way will have variations in the intensity of color because of the simple fact that some hides, or even portions of the same hide, will absorb more dye than others. Surface finish is not applied, and because of this, full aniline leathers are more absorbent, and will age differently than others. 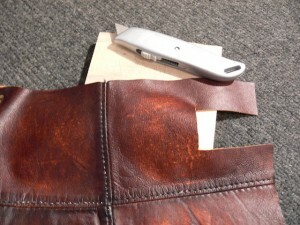 Over time, the leather will develop a rich patina finish, giving your leather furniture a natural character and beauty. Semi-aniline leather is dyed the same way as full aniline leather, but then enters an additional step. The surface of the leather is micro-pigmented to achieve more uniform coloration and create color consistency from hide to hide. Next, a protective topcoat is also applied to provide additional resistance to soiling and fading. There are a wide variety of colors available in semi-aniline leathers and they exhibit much of the softness associated with full aniline leathers. Corrected Semi-aniline leather are leathers in which naturally occurring imperfections are buffed, or lightly sanded before embossing the surface to achieve a more uniform grain. The dyeing process is the same as semi-aniline leather, however some softness in the leather is sacrificed as a result of the buffing process. These leathers are easy to maintain and have great fade, soil and wear resistance. This entry was posted in Leather Furniture Buying Guide and tagged aniline dyed, buying leather furniture, corrected leather, full aniline, Leather Furniture Buying Guide, leather furniture information, pure aniline, semi-aniline on June 5, 2010 by LeatherGroups.